We're past the half-way point on FO Week, and I am so excited and inspired by all the great projects that are flying off your sticks! Ragan has racked up her first FO Week FO after overcoming a cold and completing her colorful "little man's socks". Just look at the wonderful, cheery colors on those beauties. And don't you think it's time for her to change her blog title? She obviously knits VERY well!!! Jenn is celebrating her 200th post with yet another FO. This time it's a lovely S'nB Nation hat that she modified to get just the right fit. Hop on over to admire it, and also get a good tip on some nice yarn that can be just as inexpensive as Knit Picks . . . and who doesn't need more affordable yarn, right? I've got a FO today too!! Yarn: Knit Picks Wool of the Andes in Cranberry, with Lion Brand Jamie Pastel Pink for tie. 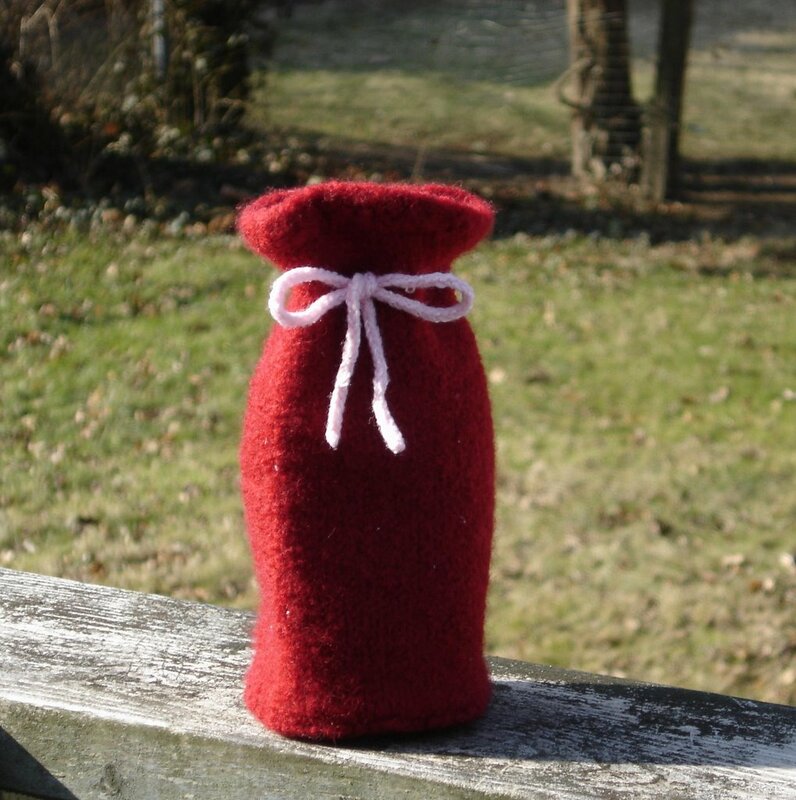 I started knitting this felted gift bag in the informal KAL of sorts on Susan's blog. I knitted step 1 on the first day, half of step 2 on the second day . . . and then promptly forgot about it. I'm glad I picked it up again and finished, as it was a lot of fun. I will certainly be knitting more of these in the future. It's my first foray into felting (or I guess more technically, fulling) and I now understand what all the hoopla is about. It's like a little bit of magic in your washer!!! I knit this totally with stash yarn. After several attempts at designing a tie, I settled on this tedious teenie two stitch i-cord with made with baby yarn stash. To be honest, I really hated working with the pink yarn, it split A LOT, but it looks like it's been discontinued. Maybe I'm not the only one who didn't like it. It was worth it though, because I think the pink tie makes it look perfect for Valentine's Day . . . so I'll have to fill it with something good for my sweetheart. As you can probably tell, the gift bag picture was taken OUTSIDE. Wait, it gets better. I have clothes. On the clothesline. In Connecticut. In February. Sheer madness, I tell you. At 45 degrees, it's down right balmy here. Let me point out right now, I am so not complaining. I'm not a bit winter fan. I'm also not a big dryer fan, as in I never use mine. That's right . . . she hates meatballs, she doesn't eat mashed potatoes, and now she's admitting to not putting clothes in the dryer. Well, my mom never used the dryer. And I'm afraid it will ruin the clothes. And why pay for electricity when the sun and air will dry them for free. In the winter our clothes spend time on drying racks stashed in the dining room corner and in the spare bedroom. I'm so happy to have some hanging outside in February!! Now that I've shown myself to be a complete wack-job, I'm about to give you a tip that may redeem me. Want to line up some good Karma? Well, head on over to Jill's blog and join her Karma Swap. Have the fun of gifting, clean out your own stash, and get some cool yarn in return as well! Genius, I tell you! I FINALLY finished my socks - and posted them!